The UK's planned exit from the EU has the potential to negate overall growth in Europe. The UK's upcoming exit from the European Union is expected to hit the region's new-car market in 2018. Most EU countries are expected to see increases in demand, as rising employment, higher wages and greater consumer confidence support vehicle purchases. However uncertainty over the UK's future relationship with the EU as well as inflation fueled by a weaker pound could lead to an 8 percent decline in Britain's new-car sales to about 2.35 million, according to PwC estimates. Analysts at LMC Automotive are more optimistic, forecasting a 5 percent decline to 2.41 million. A UK decline could reduce overall growth in Europe because of the size of the British market, which is No. 2 in the region by new-car sales after Germany. "The UK is turning south so much that it could eat up all the growth elsewhere" in Europe, said Christoph Stuermer, PwC Autofacts global lead analyst. PwC Autofacts expects European sales in 2018 to rise 0.5 percent to 15.75 million. LMC foresees a rise of 1.3 percent to 15.89 million. Those numbers have auto executives concerned. "The European market still has some growth potential, but the uncertainties of Brexit, with the UK being the second-largest market, has a spillover effect," said Ian Robertson, who is transitioning from being BMW brand's sales boss to the automaker's special representative in the UK. "The UK is very unpredictable right now," he said. Nissan Europe sales boss Philippe Saillard also warned about the market's volatility. "We are already seeing that private demand in Great Britain is collapsing so we have to be careful which sales channels we choose," he said. Exporters are already preparing for a worst-case scenario in the UK at the recommendation of business associations such as the Federation of German Industries. 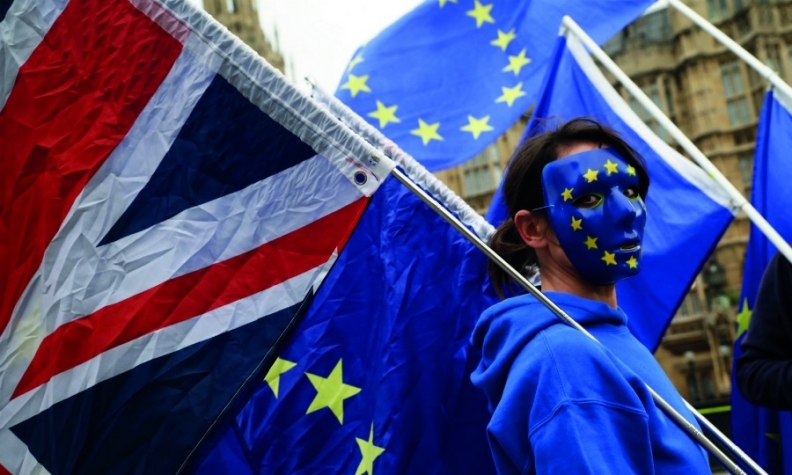 There is a deep divide between Brexit supporters who favor surrendering some sovereignty in exchange for EU market access and hardliners in the ruling Conservative Party. Apart from the UK and neighboring Ireland, leading indicators are positive for Europe's new-car market. This suggests little stands in the way of another solid economic year for countries sharing the euro or those, such as Sweden and Poland, that are part of the broader EU. Subcomponents of the eurozone purchasing managers' index, for example, revealed new 17-year highs for manufacturing orders and jobs growth last November, according to IHS Markit. At a seasonally adjusted 8.8 percent, the unemployment rate throughout the bloc hit a low last October not seen since the start of 2009. 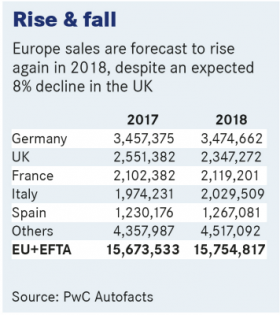 Nevertheless, analysts are taking a more subdued view of Europe's overall new-car market for 2018 because they fear that after four consecutive years of gains the recovery is due to slow down. Some experts are wary about the effect of the possible end of cheap car loans as monetary policy gradually tightens. "It's really a question of when you go to your dealer whether you are going to have to pay 4 percent, when a lot is done at the moment through 0-percent financing," PwC’s Stuermer said. There is also uncertainty about Germany, despite broader trends pointing to a rise in private consumption helped by manufacturers' incentives to trade in older, dirtier diesels. The concern is that since the start of this century, Germany has always slid backwards the few times volume has risen above 3.4 million, which it did last year. "At this time, we are facing two opposing developments. On the one hand, the trade-in bonus is boosting the market, while on the other there is a tangible feeling of uncertainty owing to the debate on diesel bans," said Matthias Wissmann, who is president of the German automotive industry association VDA. At the moment, however, car buyers are proving more resilient than economists expected. Jonathon Poskitt, director of global sales forecasts at LMC, said this is feeding through into big ticket purchases. "[The uncertainty] is being outweighed at the moment by underlying strength in the economy," he said, "and the release of pent-up demand."